I am a big fan of Quorn and I have managed to convince Daddy, big J and little J to try some of the range and they do like like some of the products. I am not a vegetarian but I have mentioned it before that I'm just not a big fan of meat. I like dishes that include meat such as lasagne and casserole so I love the fact I can use Quorn products and they taste just as nice. These are probably the most popular products we buy. 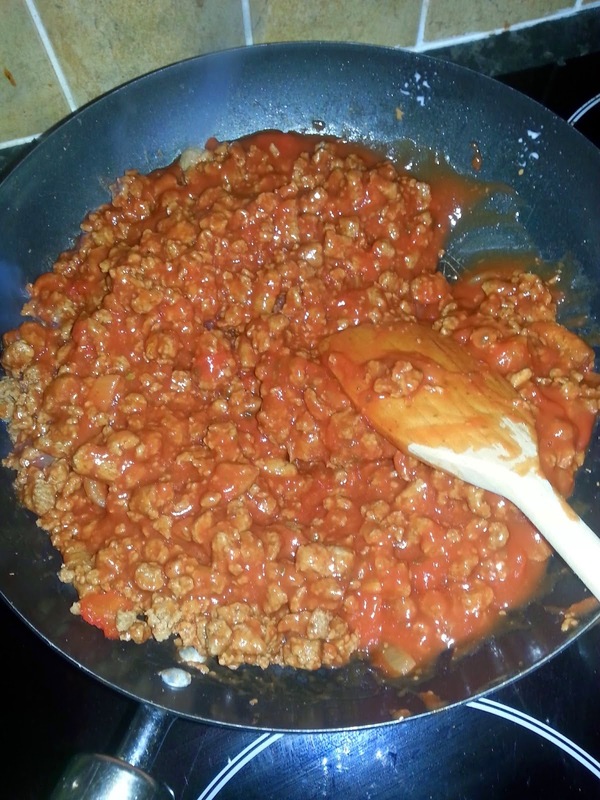 We use the mince for lasagne and spaghetti bolognese, sausages as part of a meal or maybe a casserole and the chicken pieces in a curry. Now I am not the greatest cook so when I make a lasagne I will use sauces in a jar such as ragu or dolmio. 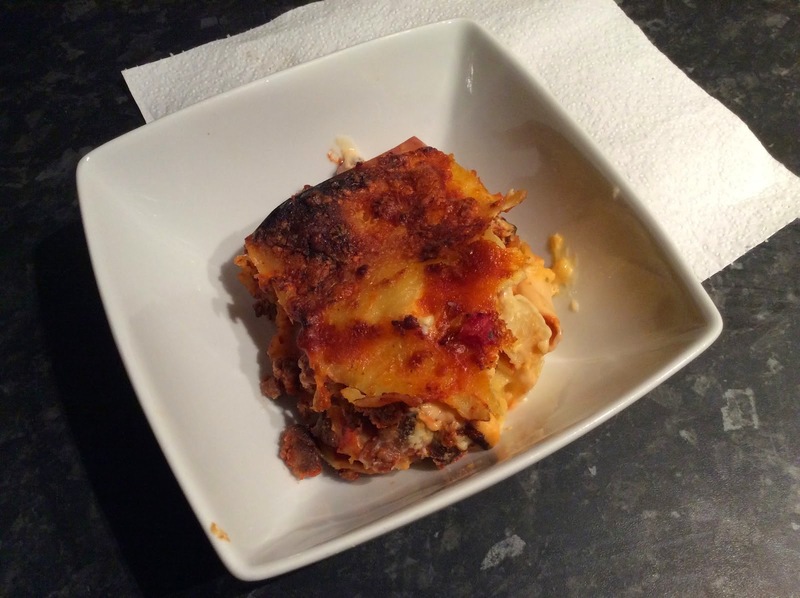 Our Quorn Lasagne is extremely easy to make. I brown the Quorn mince for 5-8 minutes first in the frying pan using a spray of fry light first. Then I add the Dolmio Lasagne sauce and stir for a further 5 minutes. 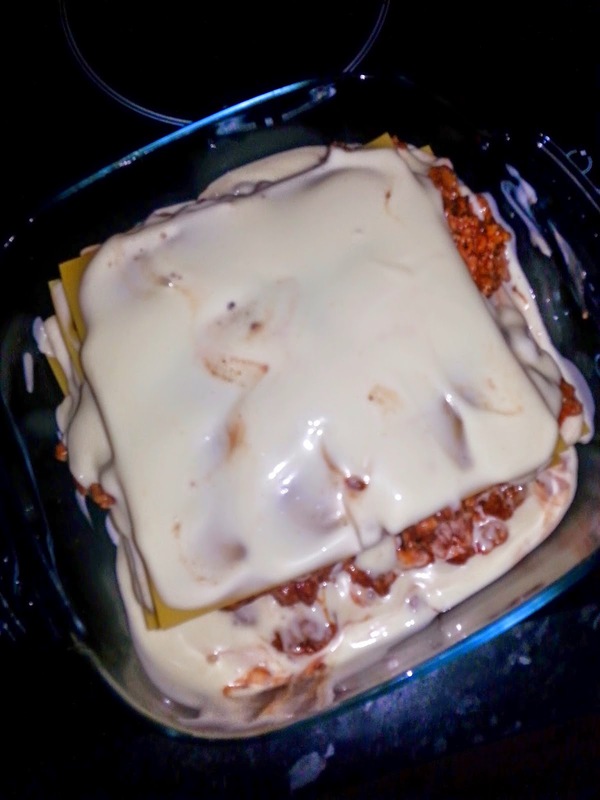 Then I scoop some Quorn Mince into my lasagne dish and add some Lasagne Pasta sheets on top. Add some Creamy Lasagne White Sauce and repeat until you have used all you mince. When you get to the last layer sprinkle on some cheese. Put in the oven for 40 mins on 180. I usually pre heat for 10 mins and switch off after 30 minutes. Our Quorn Lasagne will feed all four of us for Dinner and I usually reheat the rest the next day for little J's lunch and sometimes we can get another lunch too. Quorn is a great tasting range, perfect for if you're trying to eat healthier as part of an active lifestyle, watching your weight or if you want some meal free meal inspiration. Have you tried Quorn? What do you think? 1. Buy a Christmas tree 2. Try to convince daddy that blue lights in the window are not as nice as multi coloured flashing ones. 3. Make a list of all the Christmassy movies I want to watch. 4. Visit Disneyland Paris. 5. Start thinking of ideas for presents for family. 6. Go late night Christmas shopping. 7. Make a start on wrapping presents. 8. 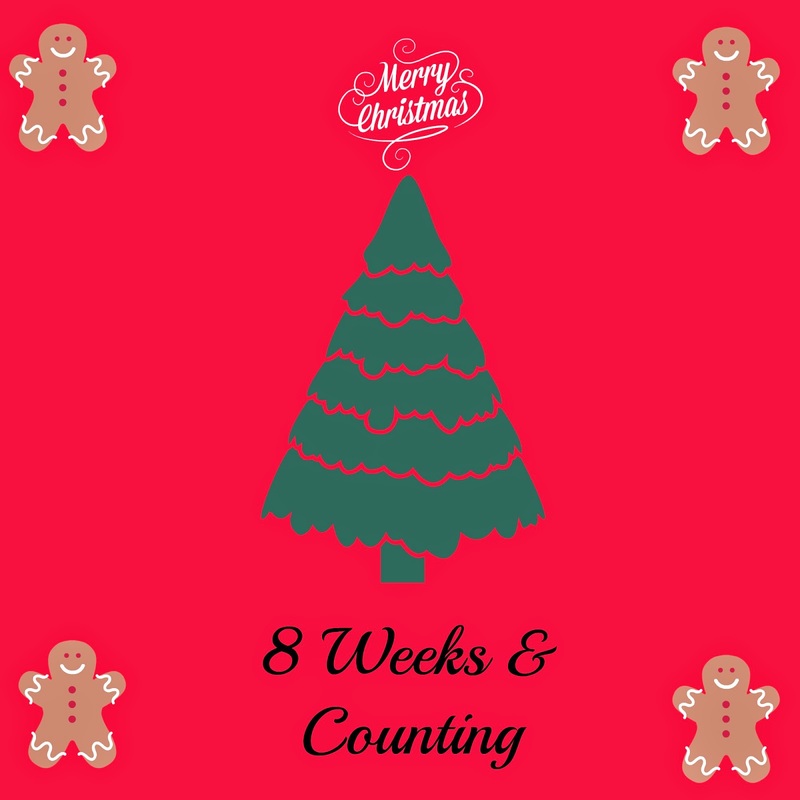 Make my Christmas songs cd for the car. 9. Buy a new Christmas tree decoration. 10. Put up our Christmas decorations up. Have you made a Christmas To Do List yet? There are 12 exciting designs to choose from and although I love Mickey, Minnie, Bambi and Winnie the Pooh I would have to choose a Princess blind. I had a browse through the collection and they are so lovely. I don't think Daddy would be happy with a princess blind on our bedroom window but I know little J would love a Mickey one. Each VELUX & Disney Dream Collection blackout blind design is unique and tailored specifically to the size and shape of the window. The fact that it's a blackout blind is perfect for daytime naps. Little J doesn't like sleeping with the light shining through so this would be great for his room. It's important to note that no harmful chemicals are used while creating the VELUX & Disney blind. Oeko-Tex® Standard 100 material testing goes far beyond existing national legislation for health protection. After reading about the blind I clicked on the link to configure my dream blind and it was really simple to use. I chose my window type and window size. There is a guide to help with this if required. Once that was done, it brought up the options for the design. On the right hand side it generated the price, based on what I asked for. I am so impressed with the blinds and I will definitely consider one for little J's room. Which one would you choose? 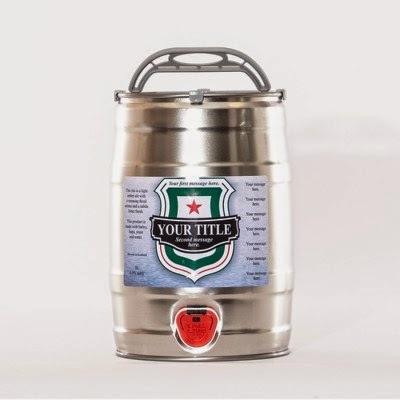 Personalised Bottles are the only online retailer to sell personalised beer kegs so this will be such a great gift for someone. I have someone here who would love to own one of these so maybe he might get lucky and Father Christmas might put one in his stocking. The ale is a light amber ale with a floral aroma and a subtle bitter finish. 4% ABV and 5L in size. The keg can be personalised by adding a message and a photograph to make it as unique as you wish. If you are not lucky enough to be the winner you can buy online for just £39.99 by clicking the link below. To view many more personalised gifts you can click HERE to view their sister website Caledonian Hampers So to enter all you need to do is answer this easy peasy question. Write your answer as a comment and once you have done that lots more options will open up for you to get some extra entries. I have to be honest and say that I hadn't heard of zhoodz before but I am so glad I checked them out. Its new and unique and the first of its kind. They have designed a range of clothing that lets you be seen day or night. 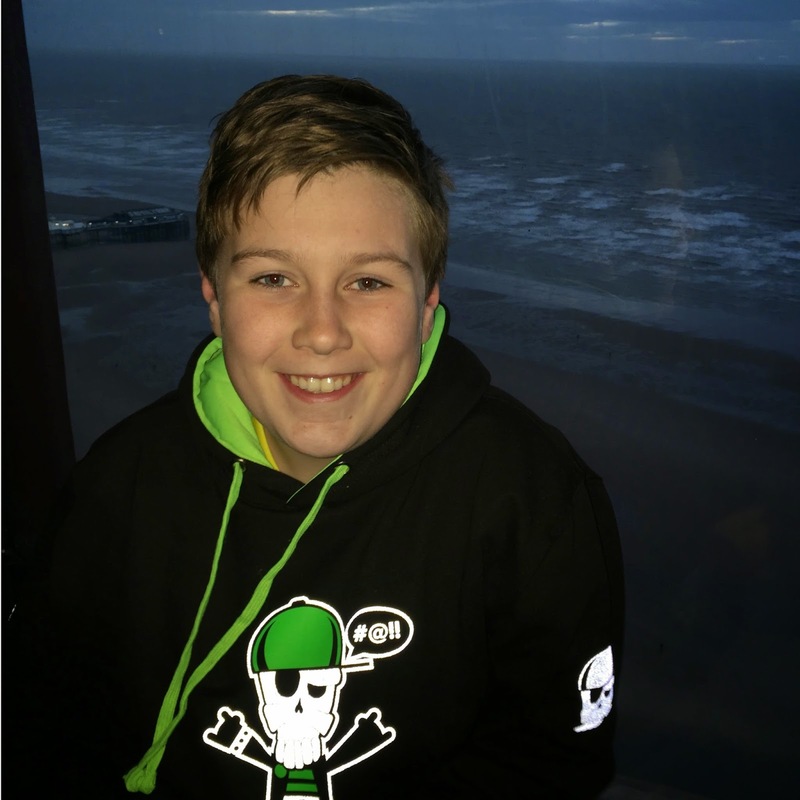 Not only does the collection of hoodies, tees and sweatshirts come with cool designs they have enhanced visibility colours and reflective designs. Perfect high visibility piece of clothing for night time. During the day those skulls cannot be seen but as soon as night time comes the light off a camera, or a cars headlight will reflect and the skull becomes visible. 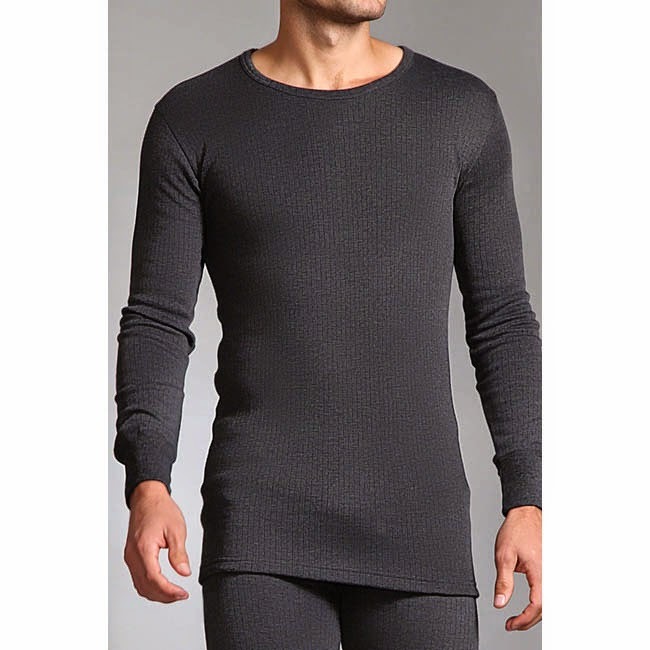 Reasonably priced, washes great and big J absolutely loves it. I have been browsing the House of Fraser website to try and find a nice suitable outfit for little J to wear. There is so much choice for both boys and girls. I used the filter to select boys age 2 and it still came up with over 1,000 options eek! I filtered again to jumpers and I found the perfect one. Made by Howick and priced at just £24.00, it is so cute and perfect to fit in with little J's style. It has a very wintery feel with a snowflake pattern but I know will keep him warm on bonfire night and throughout the cold months. I chose blue but it also comes in a lovely dark red colour too. I wanted to team the jumper with some nice jeans. Jeans are perfect for winter months. They are so thick and warm and I always think they are great for little ones who are still in prams. I found these from Pumpkin Patch And they are currently priced at £22. The have a lovely soft feel and the have elastic at the bottom of each leg which is perfect to keep little J's leg brace in place. I was really please with the outfit I chose. As soon as it arrived I tried it on little J to make sure they both fitted. I ordered 2-3 in the jumper and it is quite a generous 2-3 so he will have plenty of wear and the jeans were a 2 and again a nice fit. He looks so grown up. Daddy isn't getting a new outfit for bonfire night he is too old...haha but he will still be warm. You all know already we are big fans of Heat Holders. We have tried the socks and a gorgeous throw blanket and now Daddy is trying out the thermal underwear. Have you checked out my Dr Oetker Competition? 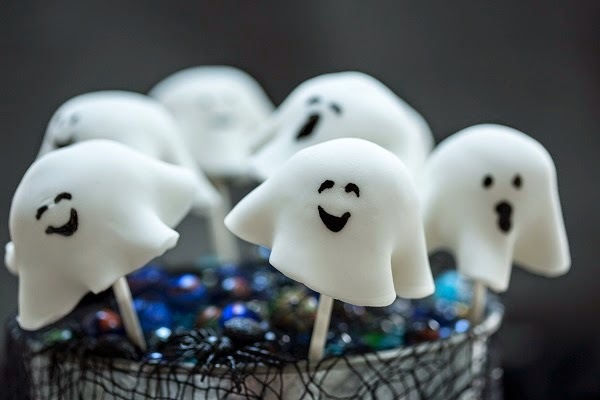 you can win some fantastic Dr Oetker baking goodies and if you are a fan of baking then I have a very spooky recipe for you. Dr. Oetker Jet Black Gel Food Colour. I actually cannot believe that I am writing this but oh my goodness it feels great that I am. Little J walked 8 steps alone yesterday and I am beaming with pride. A very special moment for us and especially for little J. Over the past few weeks he has started to stand alone and has also walked lots more than he ever could, while holding on to something. Last weekend I took him down to the waterfront for a walk and he walked all the way along holding on to the railings. It did take us nearly one hour including little breaks but he loved every minute. He has a clam shell leg brace which is like a shin pad but it fits all the way around his leg. This is to protect his tibia from breaking and also helps to relieve pressure of his other bone. Since he has had it fitted he seems lots more confident and along with his special shoes or any wide toe fitting shoes (like the ones in the photo) I think there is no stopping him now. We had a feeling he may just surprise us and walk alone so we had the video camera ready on the table to point and shoot when we thought the moment would come, but he caught us off guard - the cheeky monkey. I did manage to capture little bits on my phone but since then he hasn't walked as many steps alone. He tends to do it more when his big brother is around. I will try and get some footage of him tonight and post it but until then I am one very happy mummy. Energy Drinks - Do our kids really need them? I remember when I was little, me and my mum walked to the chemist to buy a bottle of lucozade for a relative who was sick in hospital. When we got to the hospital I remember seeing the brown cabinets next to the hospital beds on the ward and pretty much every one of them all had a bottle of Lucozade on top. How did it go from being available in just chemists and giving to loved ones when sick to being available for our kids to buy in every shop. I am not a fan of energy drinks at all. Whenever we are in a shop and big J asks for a lucozade or something similar I say no. I don't like them and although this causes quite a lot of arguments between me and big J I am sticking to my opinion on this one and I won't be budged. Big J does some sporting activities in school and he does play football on our local astro turf pitches but for me that is not enough for him to need a full bottle of an energy drink. He tells me that the footballers drink it, but the footballers train or play football probably 7 days a week, he doesn't An average bottle or can of energy drinks can have up to 14 times more caffeine than a can of cola. That's like drinking over 7 cups of coffee in one go. I wouldn't drink that much in one go so why would I let me child? It isn't just Lucozade that bothers me. Actually Lucozade isn't the worst one it's drinks like Monster and a Relentless. They do display warning saying high caffeine, but shops still sell them to youngsters? Why? Like everything it's down to choice. You are either happy to let your child drink an energy drink because it's cool and their peers do or like me you put up with the arguments and sulking knowing that you have done the right thing. Do you agree with youngsters drinking energy drinks? All you have to do is answer the following question as a blog comment. Q: what is the name of the colour of the lip gloss I am giving away? Remember you must leave the answer as a blog comment to be entered in to the draw. Competition closes on Wednesday 5th November 2014 at 11:59PM Entrants must have a valid UK address Bulk, third party or any other entries using automated software will be disqualified All entrants and entries are checked and verified. All entrants must follow the mandatory step and answer the question as a blog comment. 1 lucky winner will be chosen at random by the Gleam application. Mummy2Monkeys will contact the lucky winner within 1 day of the competition closing The winner must respond within 28 days. If no response a new winner will be chosen. The prize is a Barry M Loud Mouth Extreme Lip Colour In Screamer There is no cash alternative. 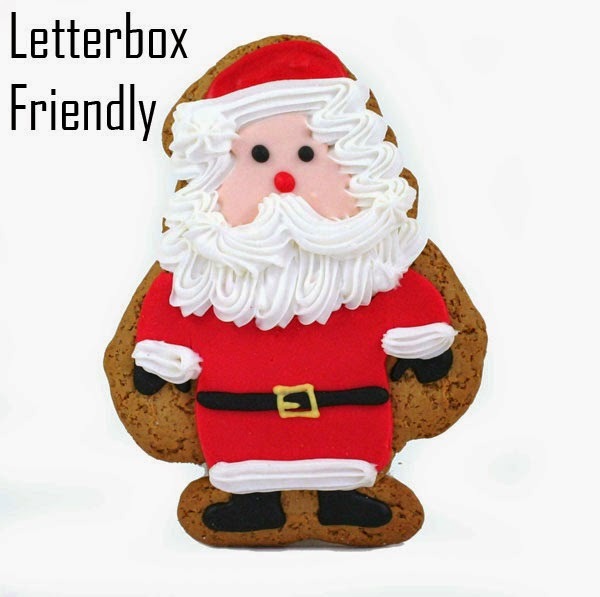 We are big fans of Sugarpoke already and recently we were sent a treat to try from their letterbox range. Bitesized Belters are exactly how they sound. Bitesize treats that are just so yummy. 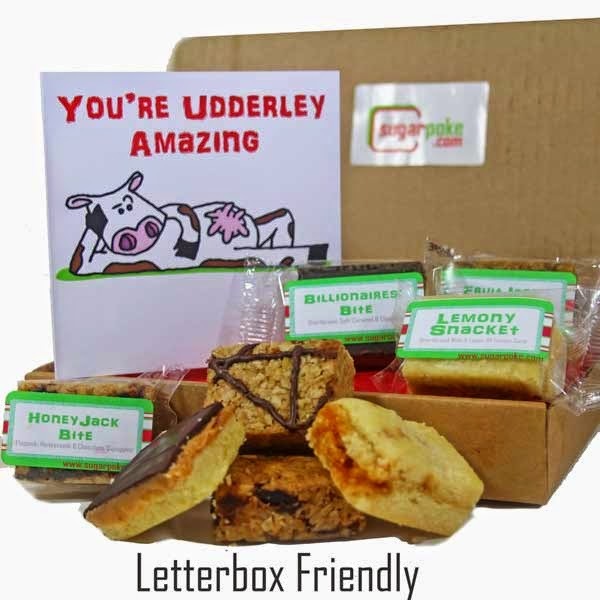 Like I mentioned they are letterbox friendly so no need to worry about waiting for the postman to arrive. Included in the Bitesized Belters are 2 x Lemony Snacket The shortbread snacks are bake with a layer of lemon curd. I am not a fan of anything lemon flavour really so it was up to Daddy and little J to try these and they loved them. I did have a little nibble on one just out of curiosity and they were full of flavour. 2 x Billionaires Bite Very similar to a millionaires shortbread. Chocolate, shortbread and caramel in one little bitesize package, delicious. We actually buy something similar from Costa and I have to say Billionaires Bites are tastier. 2 x Honeyjack Bite Flapjack with honeycomb and chocolate squiggles. I scoffed these before anyone had a chance to have a try...oops. What can I say? Very tasty. 2 x Fruitjack Bite A five fruit flapjack with sunflowers seeds. Again I enjoyed BOTH of these with a cup of tea. I sound really greedy, don't I? Oh well they were tasty and Mummy doesn't share when it comes to flapjacks. Currently priced at just £7.99 including a lovely card and first class delivery. Little J tucking in. As many will know I love christmas so I did have a peek to see if there is any christmas goodies yet. I did spot this and as soon as I spot anymore I will keep you all informed. Last week I was invited to attend a very special launch event. I have never attended anything like this before so I was a little nervous but I travelled to Manchester and I am so glad I did. I arrived at the headquarters of PZ Cussons, the brand behind the mother and baby brand Mum & Me and was accompanied by a few fellow bloggers. The reason we had been invited was to celebrate the partnership between Pz Cussons and The Royal College of Midwives and Wellbeing of Women. A nationwide search was made to find just one midwife who would receive financial support of £60,000 to enable the midwife to study for PhD. Kerry Evans was chosen and we got to meet her and her manager too. Both ladies were absolutely lovely and friendly. They have both been on this journey together and you could see just how proud she was of Kerry. Kerry who has now been a midwife for 10 years told us how it was the care she had received during her first pregnancy that had inspired her to start midwifery training. Kerry will be focusing on how midwives can support mums who are anxious in their pregnancy. I can relate to this in so many ways because I know that I just breezed through my first pregnancy with big J. I was so young and naive and I really didn't think about anything other that 'what was next to buy for the baby' I was nervous about giving birth but I didn't have anything to compare to so I just went with it. Having a miscarriage, made my other pregnancies so much more nervous and I would panic at every little thing. 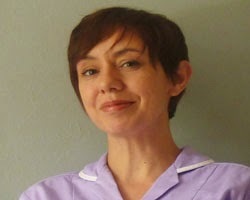 Its nice to know you have a caring midwife there to help and talk you through these tough times. After speaking to Kerry we had a very short presentation about the partnership and the grant offered to Kerry. 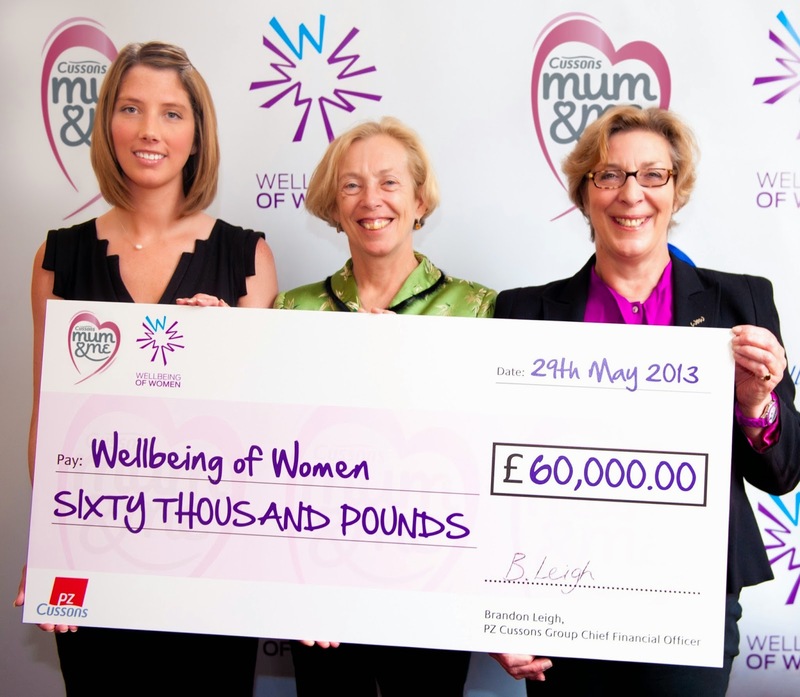 I think Mum & Me is a perfect brand to team up with this amazing opportunity. Once the presentation had finished we were left to enjoy some afternoon tea and talk to Kerry about her journey. I have to share a photo of the cake cart. Wow, it was amazing. Everything looked so yummy. I enjoyed some tea, sandwiches and cake. Once we talked to Kerry we also spoke about the Mum & Me range. There was just so many products I was unaware of. Our local tesco must only stock 1/3 of the available products. My eye was drawn to the Baby Snuffles because little J has always got a runny nose. I was lucky to be able to take some home and give little J a nice bath. The smell was lovely not to over powering. I had a really lovely time at the event and I wish Kerry the best of luck. Sometimes its nice to go on family days out that don't cost lots of money and today was supposed to be one of those days but we gave big J £4 to spend on the games while little J took a nap. He had a go on a motorbike game and because he came 1st he won a free go. He spent the rest of his money trying to win a minion and he did. Looking very proud of his win. A game of pool at the end of the pier. Watching Daddy and his brother play pool. Big J won. Trying so hard to walk, bless him. He is getting better. Heading back after a lovely afternoon stroll. I think you will all know by now that I am a big fan of Degustabox and I know I will continue to enjoy the surprise of opening the box each month to see what is inside. I think over the months the boxes have become bigger and better and with the new Degustabox Fridge vouchers too it really is great value for money. So in this month there were a few familiar brands that I knew of or we had received in previous boxes. Three steps in three simple pots to make a delicious meal in under 20 minutes. We haven't tried this yet but it looks great. I absolutely love Sweet Chilli dipping sauce and although I hadn't heard of this one before its now my favourite. Its so tasty and I love it with prawn crackers. I am not a fan of crisps, I much prefer chocolate but I have tried something similar to these before and they are very tasty. Daddy and big J aren't too fussed on these but at 60% less fat than the average packet of crisps they get a thumbs up from me. I've actually just ate this as I have been typing. It was delicious. For me it had more of a buttery flavour than a nutty flavour and it was very filling. Again there are a few different products in the supermarket like this but this isn't one we have tried before. I do love the idea of it, being able to have a nice juice on the go when your out and about. We were sent a toasted fudge version of this and it was so yummy. I have to admit I am not actually sure how you are supposed to eat it but we just grabbed a spoon and tucked in. We have had these before in a Degustabox I think and they are perfect for little J. A nice and juicy fruit snack in paw prints shapes. This weeks Flashback Friday is of little J. This is just hours after he was born. Little J has been trying out some of the Tesco Loves Toddler Range recently. When it arrived I was drawn to the bright colours and animal pictures. Very cute and very appealing to toddlers. This for me was just a perfect design for little J. The rim around the edge meant he could push his food towards the side using the cutlery set (see below) and scoop it up. We had very little mess to which was a bonus. Little J still uses a plastic spoon and we hadn't introduced a fork yet but I let him have a go at the both of these and they were great. They are quite light but with a nice chunky easy to grip handle. He can feed himself with a spoon already but he hasn't mastered the fork yet.. but he will in time. Little J has used a bottle like this before and if I am honest we had to stop because it would leak everywhere if he tipped it or left it on the side. This however is different as it has a valve inside which prevents spills so perfect for my little J who likes to tip the bottle upside down. We have something very similar to this already but its made of material (like an apron) rather than plastic. The design is so cute and bright but for little J I thought it was a little too young. He also really doesn't like anything round his neck while he is eating we have to hold him down to get his bib on. He wasn't keen on the plastic feel around his neck. Have You Tried Laser Hair Removal? Loving My Christmas Socks Already.